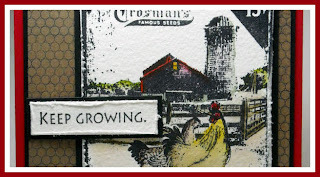 I'm enjoying mixing the images from the Artistic Outpost Bloom and Grow and Country Life plates. 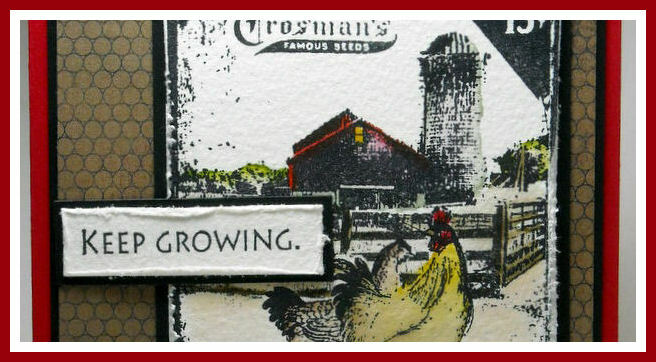 Here I've done a bit of masking to add the farm and roosters to the seed packet from the Bloom and Grow Plate. The images are stamped in Black Archival on Watercolor Paper, then colored using the Marker Watercoloring Technique. Luv how it all comes together on the seed packet! Love how you use the seed packet to frame the farm and rooster. 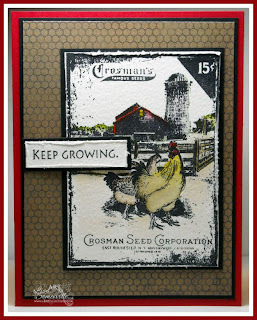 The background chicken wire stamp is perfect with this card!! Lisa, These two sets were made for you. You are doing such wonderful art with them. I love the scene you have created- that is an awesome stamp set! My mother grew up on a farm- I have many fond memories of visits to Grandma's.....! I really like the touch of yellow & red against your famous black layers, really makes it POP! Beautiful design! Love the pop of color on the rooster/chicken? these are lovely. so subtle with the coloring. they give a really warm and delightful feel. I know this is the wrong place to comment on your test tube template, but I just have to tell you that this is a very clever idea. I found a large box of plastic tubes at a thrift shop for only 50 cents. I had no idea what I would do with them, but now I have the answer! !